For over a year I have been involved in a meal swap group. 10 families (mainly wives and a few husbands) meet the 3rd Wednesday of every month and swap frozen meals. On Facebook we have our group and write what we are making to avoid duplicates and gain a greater variety. Once we meet, we line up our empty laundry baskets in a row and drop a meal in everyone’s basket. If we are all there on time it takes 5 minutes. 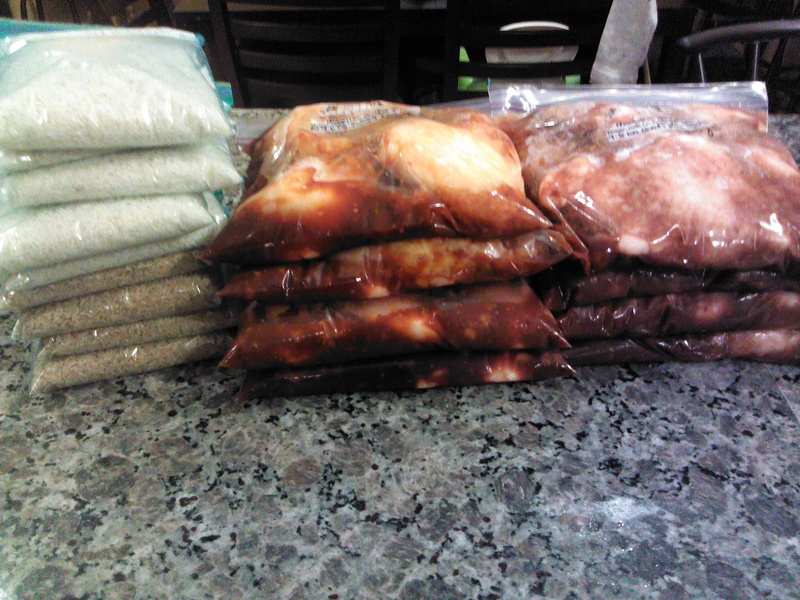 You grab your basket with the 10 new meals and PRESTO-I walk away with 10 different prepared frozen meals. I love it and it has saved me a bunch of time. This month I decided to make a recipe Emma recently tried from sixsistersstuff.com . Being that it was Sunday and meal swap is Wednesday I needed something a little easier and with a little less prep time than my past months meal of Asparagus Egg Bake ( cracking 100+ eggs) . 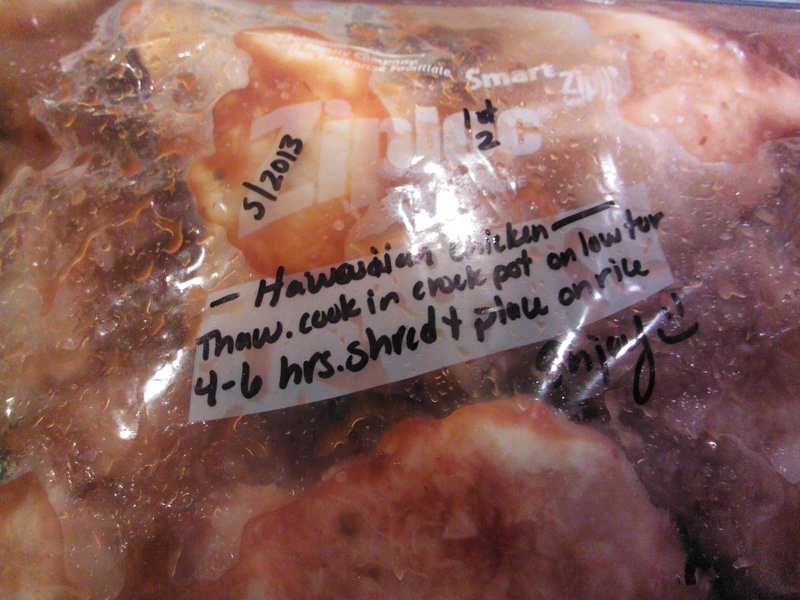 Combine the chicken, sauce and pineapple and place in a crock pot for 4-6 hours on low. Before dinner, make the rice separately by bringing 3 cups of water to a boil, add the rice and cover. Let the rice simmer for 5 minutes. While simmering, shred the chicken right in the crock pot. Once both are done place the chicken on a bed of rice- YUM!!! 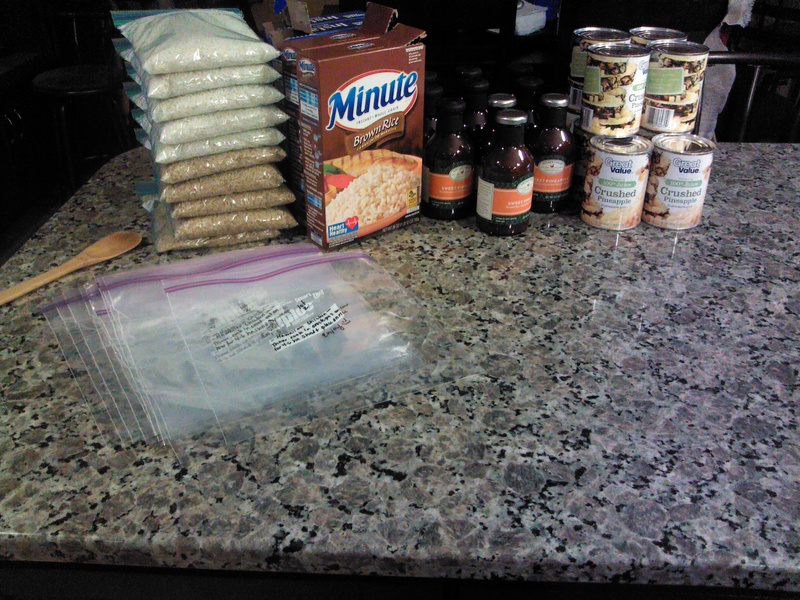 For this meal swap, I opened everything up and added each meal in a freezer bag with the written instructions, and off they go to swap.